“Simplicity is about subtracting the obvious and adding the meaningful.” ~John Maeda, The Laws of Simplicity: Design, Technology, Business, Life. So…I went and did a thing. I spent a day in the playroom and I cleared out all the Barbies, Polly Pockets, Bratz dolls, Diego and Dora toys, Littlest Petshop stuff, plastic Mega Bloks, even the Fisher Price Little People house, castle, and farm got the boot. That stuff had taken over our play space and almost all of it just sat in big old plastic bins taking up space and was never played with. There was just so much. Everything I removed from the play space took up my entire staircase, landing, and hallway once it was all laid out. I thought I might have a bit of mutiny amongst the smalls when they came back on Monday…but not ONE said anything about any of that stuff being missing. On the contrary. It was the calmest, most refreshing free-play session we’ve had at my house in a long time. It’s not that I have anything against these toys, really. 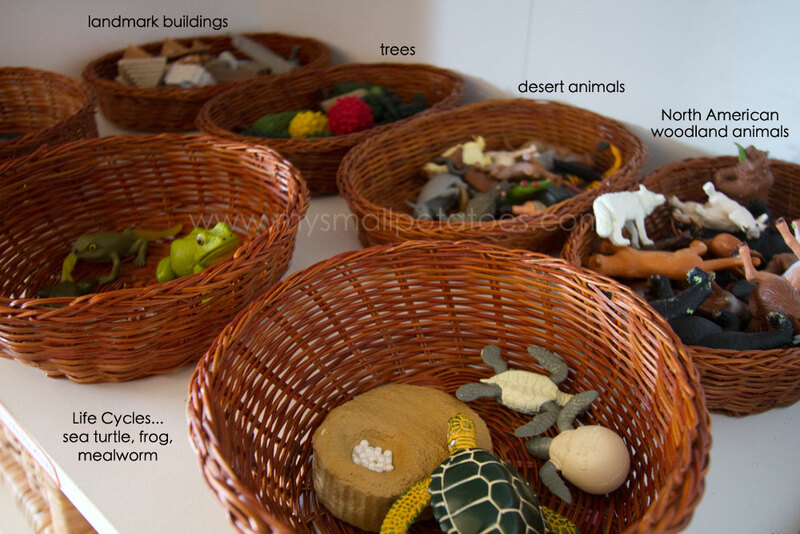 But I found that the smalls were playing mostly with the activities I create for them…sensory bins, play dough and accessories, art creation items, and natural playthings like twigs, pebbles, flowers and seashells. Things that nurture their already fantastic imaginations. Simple, simple things where there are little or no boundaries and limitations laid out by a manufacturer. It was time for a change. And it’s been a good one. We are slowly phasing out all our plastic bins also, as I found they stayed on the shelves with the lids on and no one played with them unless I brought them down and opened the lids. 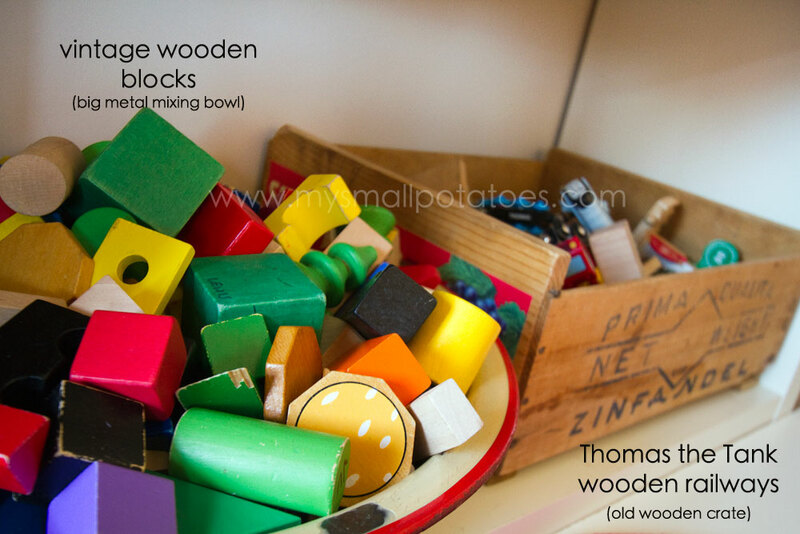 I’m finding the open bowls, crates, and baskets are much more inviting for the smalls. Our toys that remain are very basic, and longstanding. 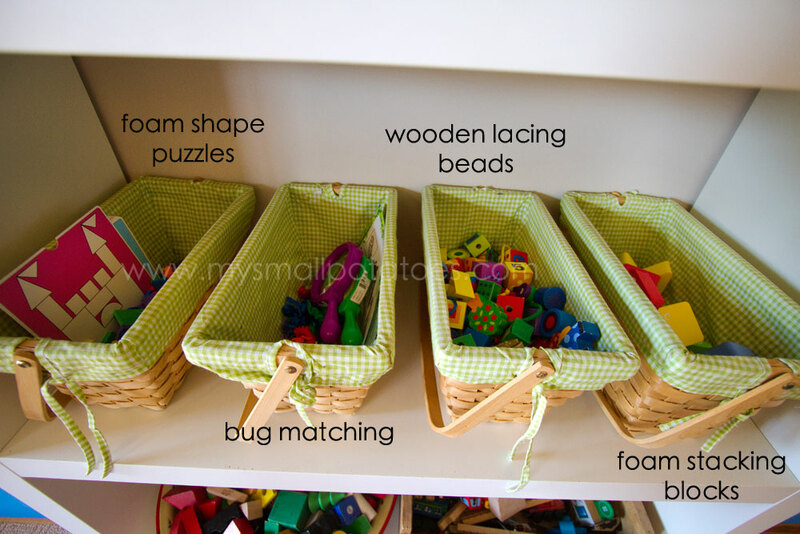 They are also the ones that get the most usage… The little baskets hold small play sets…perfect for keeping the toys visible and not buried beneath a pile of jumbled toys… I thrifted these baskets for under $4… In some of our baskets, I have added natural elements along with plastic figurines to encourage imaginative play… *These square baskets were purchased a LONG time ago at Ikea, I just dug them out of storage to replace the plastic bins. We are avid collectors of the Safari Ltd Minis, but have ALWAYS struggled with storing them and keeping them organized. I finally found a solution, and it was one that had been staring me in the face for a really long time. 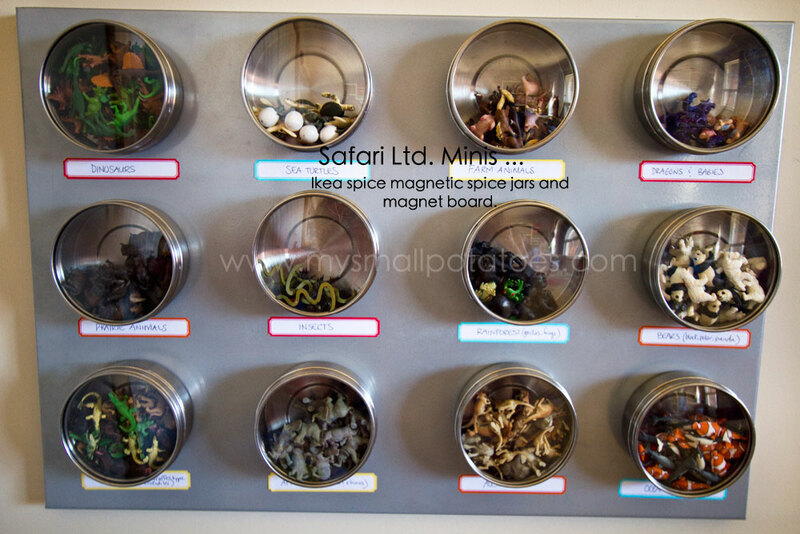 I used to be a big scrapbooker and I kept all my “doo-dads” in little magnetic spice jars with clear lids from Ikea and stuck them to a magnet board. Well, now the smalls have them… They use these minis for whatever activity they like, whether it be play dough, sensory table, blocks, water play, or even in the dollhouse. They can un-stick the jar of their choice and take it to where they are playing, as long as they bring it back when they finish. This new display is highly popular amongst the older smalls…especially the dinosaurs! Our art centre has undergone a few changes, making more “junk” items available to the smalls for whatever project they might be working on. Glue, scissors, tape, and paint are readily accessible. We still have some plastic in our art centre but have replaced some of it with baby food jars and terracotta and metal pots. 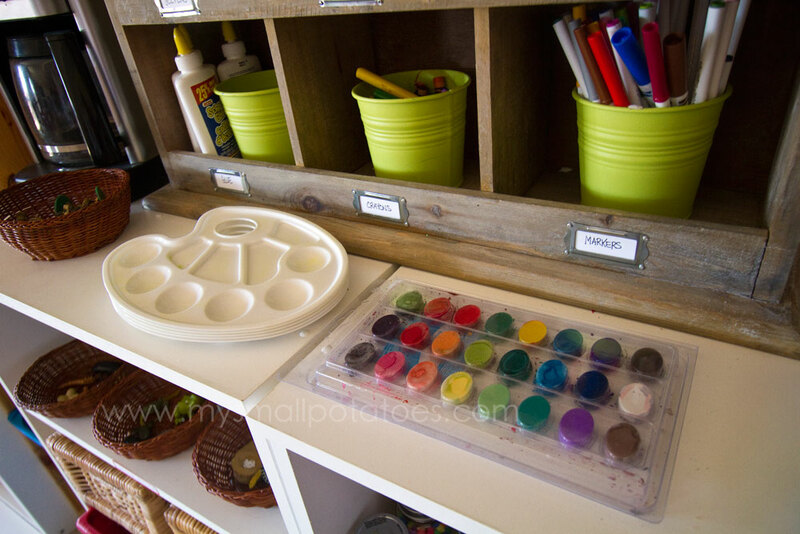 It is proving difficult to find washable, non-plastic storage bins for gluey, sticky, painty craft items… *The trays were thrifted for about $2. Here is an overview of the layout in our “preschool” area of our play space… On the other side of the room, we have our soft, baby-friendly play area, which will someday soon get a make-over too! 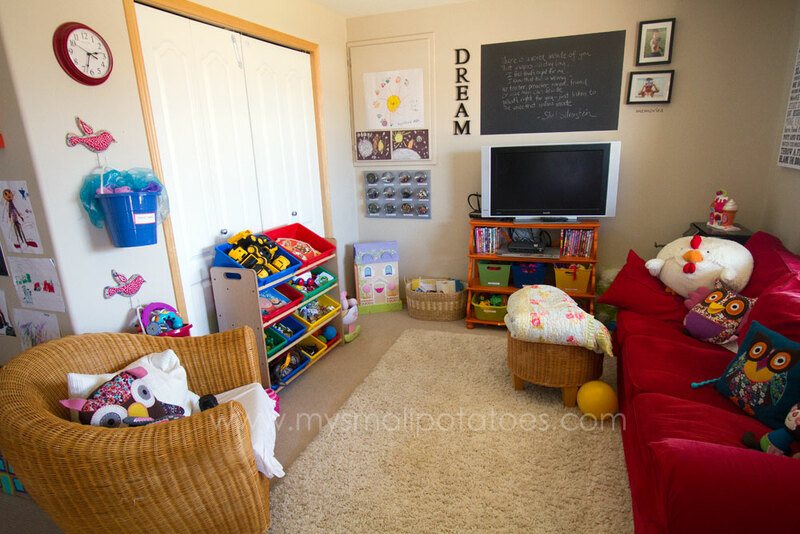 If you have any questions as to why or how I did anything in this playroom make-over, don’t hesitate to ask! My husband and I just made a new rule that we aren’t buying anymore big toys. I.e. barn, zoo, play tables. They don’t play with that stuff. We have a closet full of toys and they play with the busy bags I make and art supplies. I’m so glad to see that you did the same. I would love to de-plastic our bins for right now we are too little (almost 3 and 16 months with a 1yr old puppy who chews everything) I will someday! Thanks for the inspiration! That looks wonderful! I don’t have any kids yet, but after nearly ten years of looking after other people’s children I already know that I would prefer a small collection of traditional, simple, non-plastic toys to a whole host of branded stuff that limits imaginative play. It’s great to hear that your smalls haven’t missed any of the stuff you got rid of. Beautiful! I’m struggling with plastic vs more natural materials right now. Not sure who will win. You have a beautiful balance of natural and man made materials. Your space looks so inviting! omg this is fabulous!!!!! 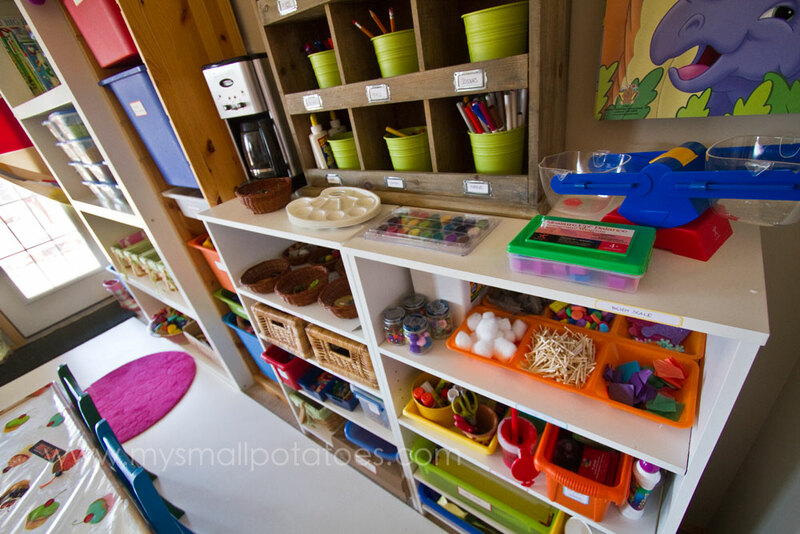 i would love to do this to my playroom, but my little one would not appreciate the organisation that would go into it, and it would be strewn everywhere after 10 minutes!! You bet! If you look up in the menu bar, you’ll see a category for sensory bins and bowls…everything we’ve ever done in sensory bins should be there! 🙂 Have fun!! Your playroom looks wonderful! I hate plastic too! 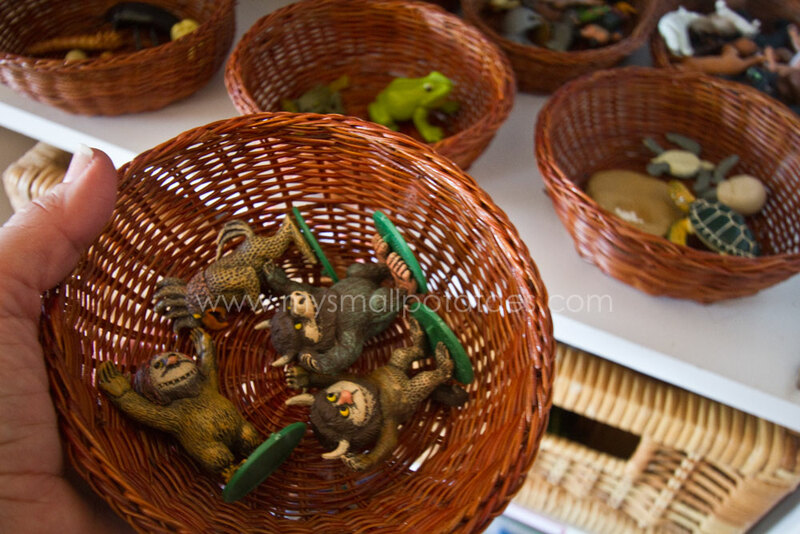 Before moving to Hawaii we had a similar basket system of very traditional toys which we had to leave behind. I let each of our four boys bring whatever toys they could fit in a small carry-on sized box. Mostly they brought legos and some cars and trucks and a few of those Safari LTD animals you mentioned. We’re going on our 3rd year without all the excess toys and they don’t miss them a bit. Great job! Very nice! Those spice containers must make the little items inside smell wonderful! 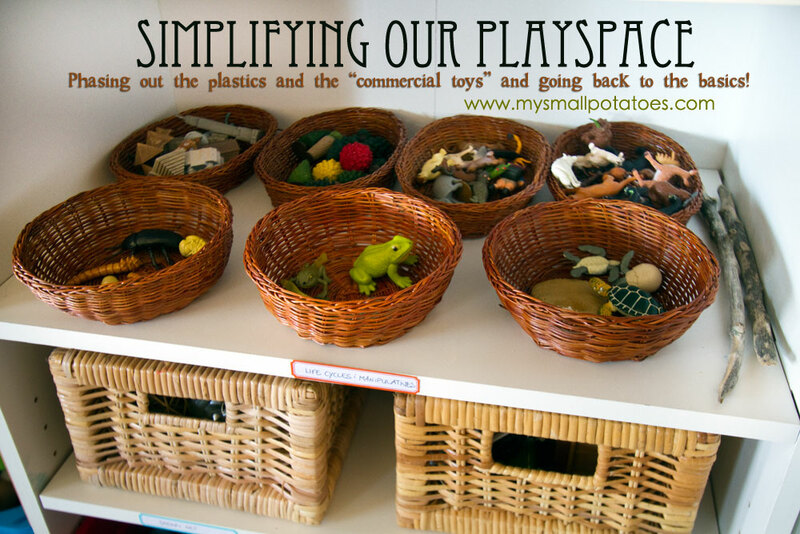 amazing play space – this is exactly how I want ours to be, but we have probably a third of the space and storage, but its totally based on the same principles. Love love love and pinning and sharing! Love it! 🙂 Are your children home schooled? Jenna, no they are not. They attend a French immersion program here in the city. They WISH they were! Lol! I run a family dayhome here in my house. I have 4-6 children every week day. Wow, you did a great job! You have inspired me! I have a 5 and 8 year old, but they would love this playroom. 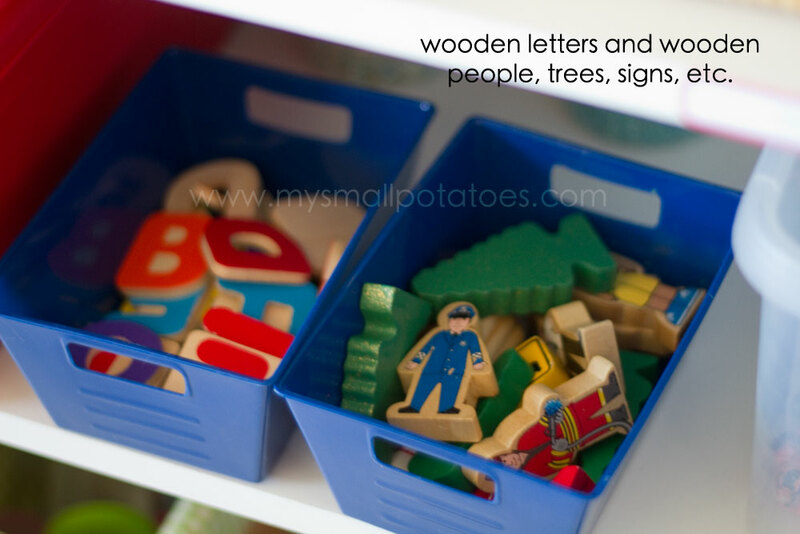 I would LOVE to do this…… i currently have shelves and shelves of unused toys! 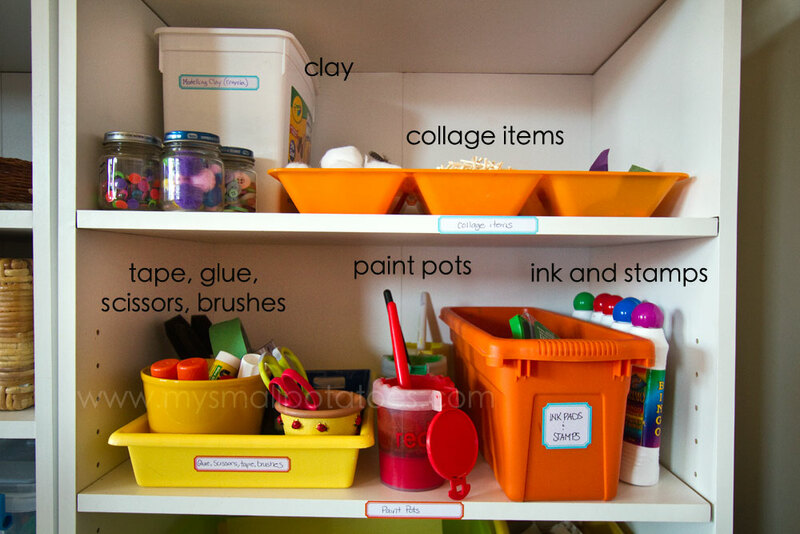 and art stuff is all hidden away from little fingers……. my question for you is……. HOW do you do this with little people and their tendancy to pull everything down for a look before moving onto the next shelf???? 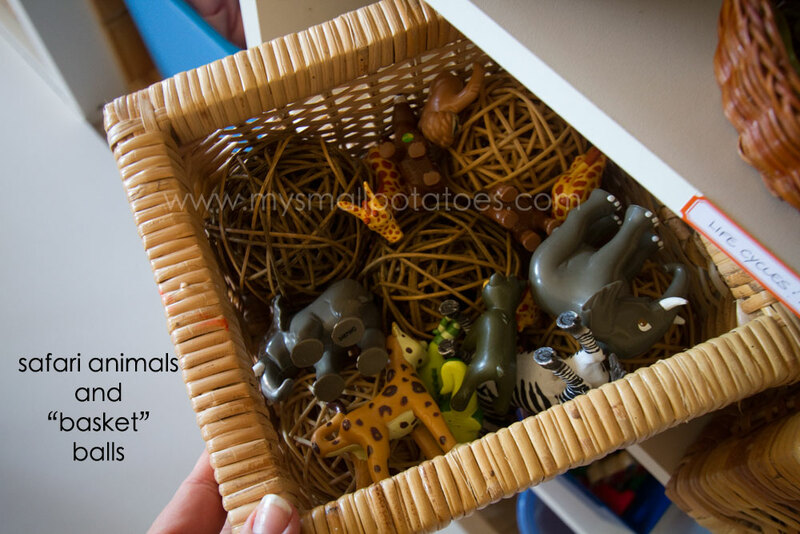 This is one of the reasons I wanted the toys in open baskets…so they could see inside and not have to tip them out to see what’s inside. 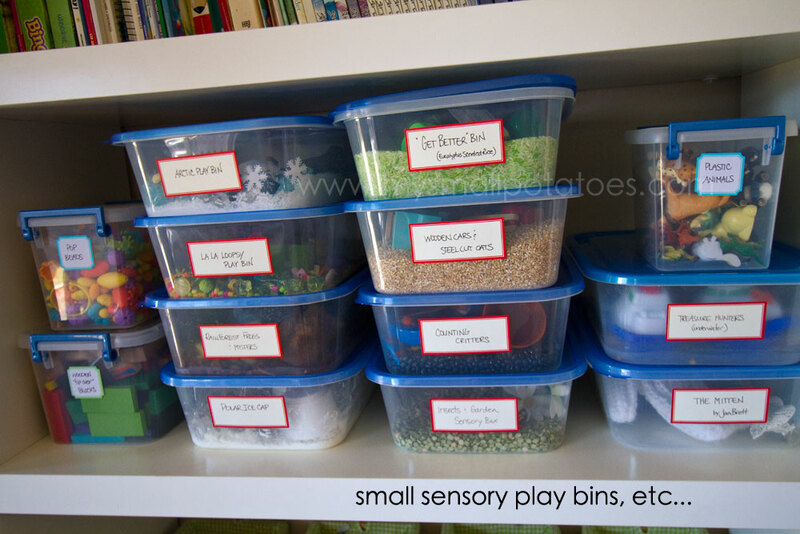 The stacked sensory bins are up too high for most of the smalls to reach on their own, but because they can see inside and are familiar with them, they know which one to ask for. 🙂 I hope this answers your question! Let me know if you have any more, and thank you for reading! What wonderful organization skills you have. Very inspiring! How do you deal with babies getting into the small chokable things? I run an in home centre as well and would love to have more small things out like this for the 3-8 year olds! Thanks I really enjoyed seeing what you’ve done . I have been steadily putting away the plastic toys at our place and they really don’t seem to notice either. I’ve been tossing up what to get me 3 year old for her up-coming birthday and it seemed like a good chance to buy a BIG toy for the girls, but having seem what you have here I think I might actually go small. Your magnetic container collection looks like a winner. I would just like to say that you inspire me to not be a good child care provider but a great one! I love, love, love your blog and all the ideas you flow to us freely! But I am becoming lost in my space…I’m hoping I can get some insight from you? How do you manage your daily routine? How do you organize/prepare ALL your activities? How do you have time??? I feel like I look at wonder woman when I see your blog…lol. I have three children myself and also run a dayhome in a small space. What does your daily schedule look like so I can copy you…lol, or get some ideas. Feeling a little overwhelmed and need help from my Number 1 inspiration source. Where did you find all your mini’s in the spice containers? Your space is amazing. Very organized. 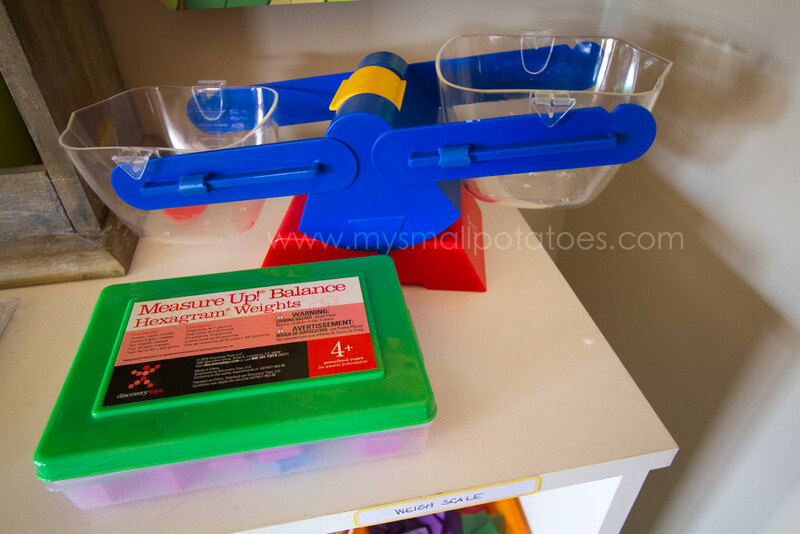 Your blog has helped me bring order to my own home daycare. I have to know where you got that huge stuffed hen. I love it!!!!! So inspiring! We just did a big dung out of my 2 year old’s toys and put most of them in accessible boxes he can see into – I can’t believe how much difference it has made to not only the mess but his behaviour. Much less acting up and much more bringing me boxes of trains or play dough and asking to play, and he is a stickler about keeping them organized – bonus! 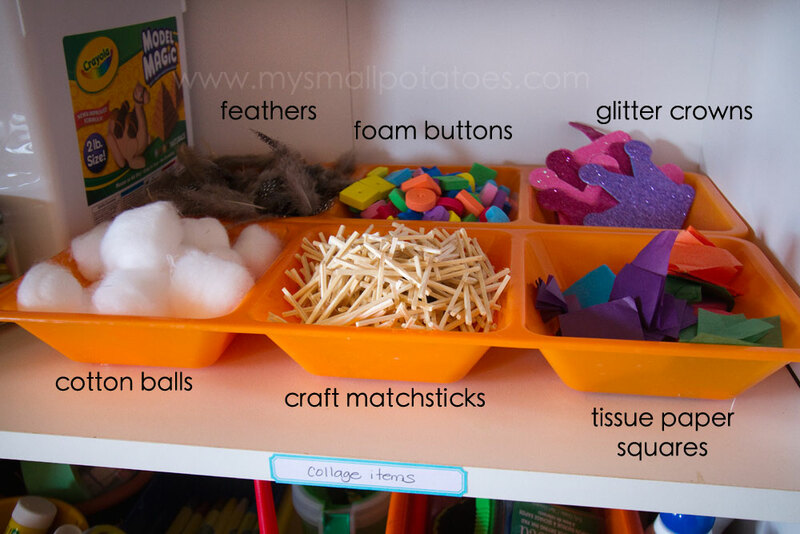 I’m not naturally very organized – I think this post will help me get the rest of the room in order – thanks so much! I love this. Thanks for the idea. We are moving and once we’re in our new home I will be doing this.